This LEADER project engages 32 local municipalities with renewable energy issues (wind, water, geothermal) in the Central Black Forest, including the development of practical tools for the uptake of photovoltaic systems for solar power production. For 2007-13, LEADER is focusing on the use of alternative energy, and the Central Black Forest region wants to provide benefits for regional trade and service sectors. Local solutions are needed to global problems, with citizens actively participating in climate protection. 32 municipalities have combined to build what they see as an optimal and holistic energy network. A publicity campaign will illustrate the potential of renewable energy, and boost its image in rural areas. The Schuttertal municipality is leading the way in developing and implementing energy efficiency strategies. Its innovative approach is to focus on realising the potential of existing renewable energy. The project will also assess the potential energy and heat loss savings of alternative construction methods. Those involved see benefits for local trades and services through increased demand for items such as solar roofing panels. This project comprises a main project which includes the potential analysis of renewable energies such as wind, water and biogas. Within the sub-projects, data on savings potential will aid subsequent consultations with municipalities or electric utilities. Project results would be communicated to residents of the area through public relations work and informational events. Practical tools for dealing with renewable energies will be given, including ‘SUN AREA”, a guideline for solar energy use. The aim is to raise awareness and understanding regarding energy problems for those living in rural areas. Experience has shown that lack of knowledge is the biggest obstacle to be overcome. 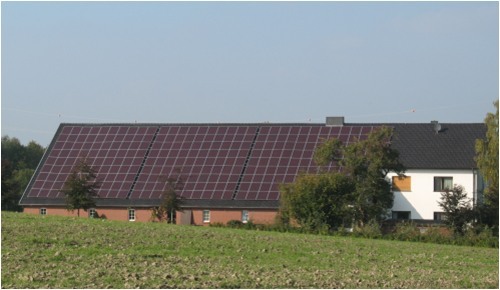 The ‘Sun Area’ sub-project was a first step – providing an interactive map showed which roofs were suitable for solar energy generation, and calculated the cost-effectiveness of such systems.This concept can be replicated beyond regional borders and teach how to create energy autonomy from renewable sources. The goal of local heat and electricity generation is only possible if the local energy usage is reduced. The aim is to network competent consulting services and increase collaboration between local utilities, energy consultants, local authorities and property owners. Potential problems need to be identified at the consultation stage and resolved by fully involving all the parties concerned. Rottweil, Baden Württemberg. Located in the southwestern part of Germany, east of the Upper Rhine.